Fritz Lang's "M" (1931) is an undisputed classic of world cinema. Lang considered it his most lasting work. Peter Lorre's extraordinary performance as the childlike misfit Hans Beckert was one of the most striking of film debuts, and it made him an international star. Lang's vision of a city gripped with fear, haunted by surveillance and total mobillization, is still remarkably powerful today. And "M" resonates too in the serial-killer genre which is so prominent in contemporary cinema. "M" speaks to us as a timeless classic, but also as a Weimar film that has too often been isolated from its political and cultural context. 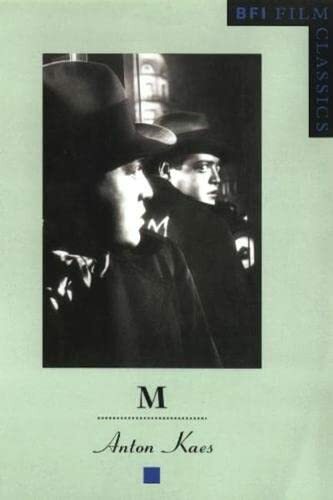 In this groundbreaking book, Anton Kaes reconnects "M"'s much-studied formal brilliance to its significance as an event in 1931 Germany, recapturing the film's extraordinary social and symbolic energy. Interweaving close reading with cultural history, Kaes reconstitutes "M" as a crucial modernist artwork. In addition he analyzes Joseph Losey's 1951 film noir remake and, in an appendix, publishes for the first time "M"'s missing scene.